Kim Maher earned an MFA in Book Arts from the University of Iowa Center for the Book where she studied letterpress printing, papermaking, and bookbinding. Prior to attending Iowa, she received a BA in Book Arts from St. Ambrose University. She is a book artist, designer, and educator with a particular fondness for pop-up and movable book structures. Her work has been exhibited and collected throughout the U.S. and abroad. She teaches at the University of Iowa Center for the book and works as an Instructional Services Specialist for the UI School of Art & Art History. In 2016, alongside Karen Carcia, Kim founded Stonecreek Studio to work both independently and cooperatively on projects. Together their work ranges from art production, job printing, to teaching. Located at a small yet mighty confluence of history and geography, Stonecreek Studio is named in honor of Kim Merker’s Stone Wall Press and the creek that meanders by their studio. 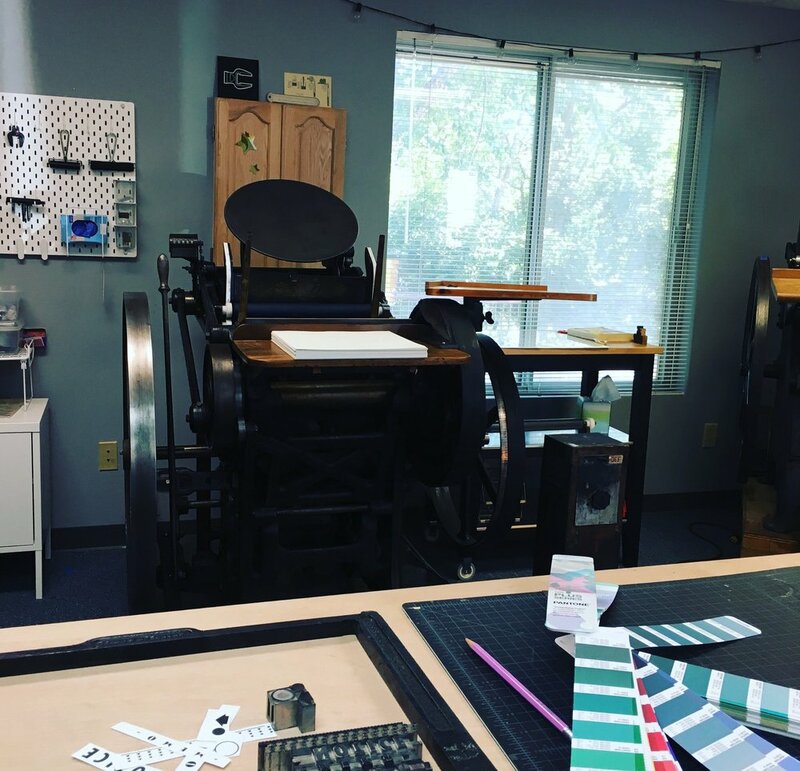 They feel strongly that printers are the stewards of the art, craft, and machinery that our métier provides and we are inspired and vivified by these connections. Stonecreek Studio is the fortunate caretaker of three historic printing presses. Priscilla Steele generously donated the Challenge MP15 flatbed proof press (1964–65) and platen press, Golding Pearl No. 14, (c. 1895). Previous stewards of these presses include Tim Fay and the talented printer of poets, Kim Merker. The New Style Chandler & Price 10 x 15 (c. 1914) was gifted in 2018 by Bradley Dicharry. Following Moon Press is the imprint of Kim Maher. She interested in collaborating with writers or poets to create limited edition broadsides or chapbooks. Most of the work on this site is available for sale or trade. Please feel free to contact with questions or comments.